Before I officially start writing this post, I need to get something off my chest. I love visiting my parents. But……I can’t seem to tear myself away from my pet boarder’s web cam. You see, they actually have a camera set up in the “kitty condo” room so you can observe your precious pet at play. However, I’ve been (admittedly) watching said web cam now for days and all I’ve seen so far is a glimpse of Dexter’s bushy black tail. Is it normal to miss you cat so much when you travel? Your cat? Maybe don’t answer that. Anyway! I hope you’re still baking. 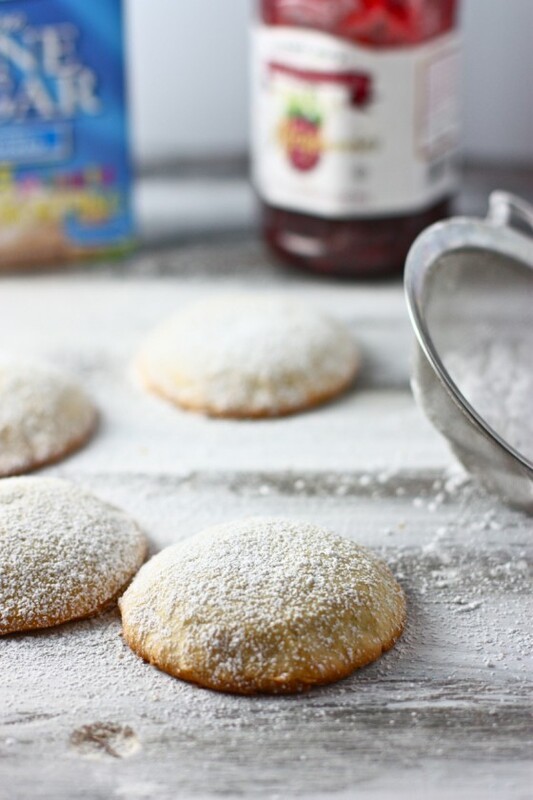 The real name of these soft raspberry jam filled sugar cookies is “daddy’s filled cookies”, “daddy” being my grandpa. You guys should just hear him talk about these cookies! His whole face just lights right up. My grandma made them every single year when my mom was growing up, and every single year my grandpa would find his way to the hidden cookie tin. After a rather intense conversation with Grandma two weeks ago, I need you to know that these cookies are not, in fact, sandwich cookies. Nor are they thumbprint cookies! 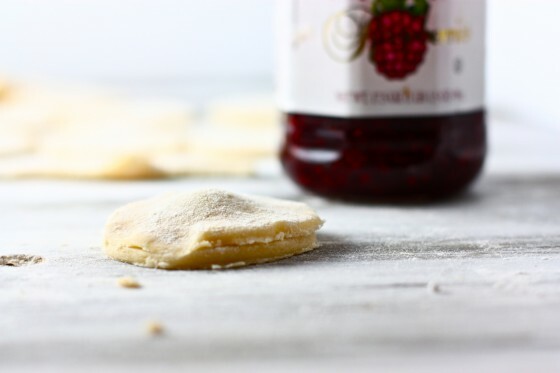 Nope—to make these cookies, you actually seal the jam between the cookies so when you take a bite you have a surprisingly delicious burst of raspberry. You can make these cookies ahead of time, but just be sure to store them between pieces of wax paper in a sealed tupperware container. That way they will stay soft! If you leave them at room temperature, they’ll get a little crunchy around the edges. Aren’t they just pretty? To me, these epitomize Christmas cookies. Yesterday evening, I talked to Grandma briefly on the phone. “Grandma? I’m posting those cookies Grandpa loves so much on my cooking website tomorrow morning!” I said as I sipped wine on our porch with my mom. Grandma laughed her throaty laugh and I could practically hear her smiling two thousand miles away. I hung up, told my mom Grandma absolutely loved the Christmas cookies she sent her and continued to sip wine on the porch. It’s the little things, people. The little things. Cream together the butter and sugar. Add the egg and vanilla and mix until just combined. Whisk together the flour, baking powder, baking soda and salt. Add dry ingredients alternately with sour cream. 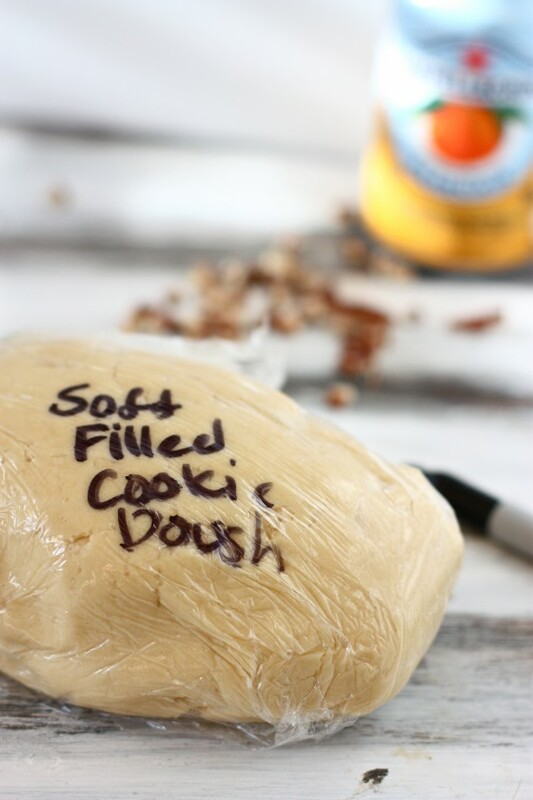 Mix until soft dough forms then wrap dough in plastic wrap and refrigerate for 2-4 hours, or overnight. Roll out dough on a floured surface and cut with circular cookie dough cutters (or just use the top of a glass!). 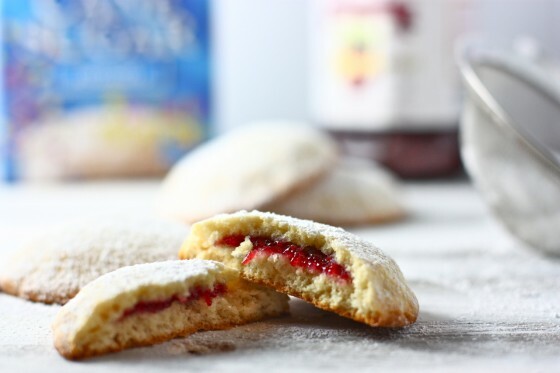 Place a scant teaspoon of jam on one cookie then place another circle of dough over top. Crimp edges tightly to seal. Place filled cookies on a lined baking sheet and bake for 8 minutes. They’re done when they’re just golden brown around the edges (watch them or else they’ll burn!). Let cool then dust with powdered sugar. Your cookies are beautiful, Jenna! 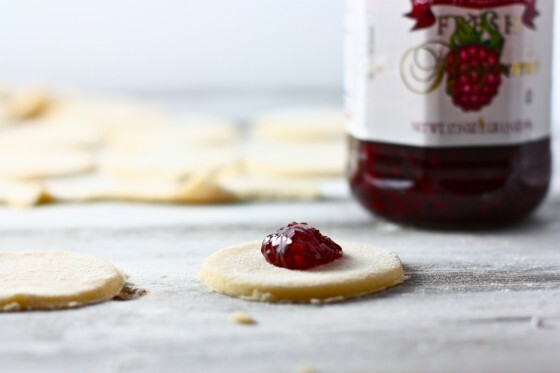 They are so delicate and pretty…definitely something I’d love to try because I loved stuffed cookies AND I love raspberry jam (well jam or jelly of any kind actually). 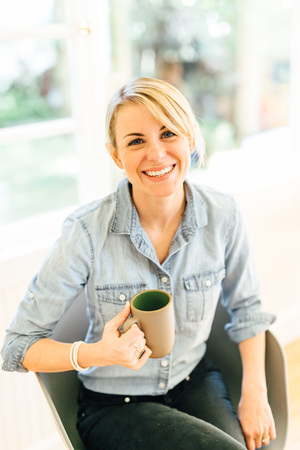 I hope you’re having a wonderful time with your family….and it sounds like you are! I love the story behind these cookies. It’s cute to see grandparents light up when they talk about their past 🙂 I would be sad too if I had to leave my pet, so no worries! These cookies look delicious, Jenna! Hehe your grandmother is so cute! And yes, the cookies do epitomize Christmas. Love the raspberry jam surprise inside! 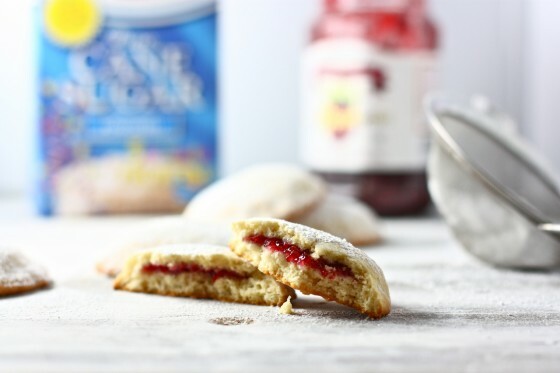 Aww, these guys remind me of the raspberry sandwich cookies that my mom makes – what is it about raspberry-filled, powdered sugar-dusted cookies that just epitomize Christmas? I’m not a huge baked good fan, but I love hearing all your family stories and recipes that go along with them. Your grandparents (and your great grandma) sound awesome! My grandfather’s favorite cookie that my grandmother made were her famous oatmeal cookies. They were a must for his lunches until he retired in his late 80s! Why are grandparents so adorable? So pretty! Your grandparents sound adorable. Actually this story kinda reminds me of my G+G. Hope home is relaxing for you! i could sit and watch my dogs for hours everyday while we are on vacation. in fact, i may have done that yesterday. shhh! Oh YUM! Seriously I need these in my life! Those are so pretty….and such a great family history behind them. 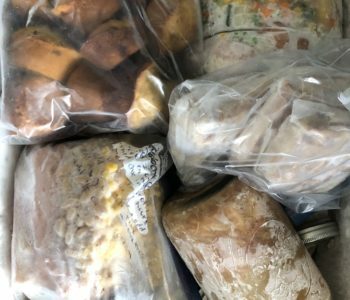 I’ve been recently baking stuff that my grandma’s used to make me. So fun. I love the history behind recipes. It makes them all the more special – and taste better too! (Although I don’t think these cookies need any help tasting better – YUM).Thanks for sharing. Um, I literally tell my husband EVERY time we travel that we should bring the cats along. So far it hasn’t happened, but I think they would make any trip infinitely better! LOL about your cat. I love that…we have our black cat buddy and (as much as my husband won’t admit) we miss him when we travel too! Love the recipe!! That web cam is the best idea ever!!! I wish my pet boarder would have that. Aw, the story makes these cookies even more enticing to make.. very sweet. Although I hope your mom doesn’t read the blog, because she’s going to hear what your grandma said haha. 😉 Sounds like something my grandma would say too! Omg, these are like cookie raviolis! I’m in love. Did your grandma really make them every single day? and your grandpa found them every single year? Sorry, I was confused by that sentence. Oh, yum. These almost remind me a little bit of linzer tarts! I think my mom would love them. 🙂 Thanks for your grandma’s tips!! Oh wow.. I’d so be a crazy cat lady for my kitty. Crazy cat ladies unite! These look wonderful! I love when cookies have surprises hidden inside. PS – I would be checking the cat’s website, too, if I were you!! The cookies look beautiful! Thanks again for sharing the family history behind your food. Will definitely try these! 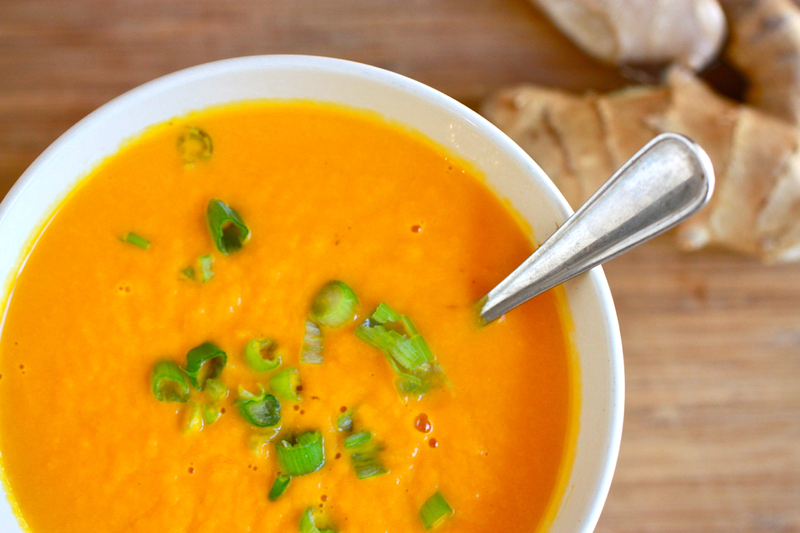 What do you think about substituting greek yogurt for the sour cream? These are so pretty…such an elegant cookie. To be eaten aside a cup of tea! I actually cried when we dropped our cats off at the “cat lodge” this summer, so I totally know where you’re coming from. When we picked them up after the trip, though, they didn’t want to leave! The lodge owner said that most cats hide for the first couple (or few) days, so we didn’t bother getting the webcam until we knew they’d be adjusted… Just thought I’d share! your grandparents must be so proud of you. they sound so cute! Missing your cat that much is normal I think! Have a wonderful Christmas!! 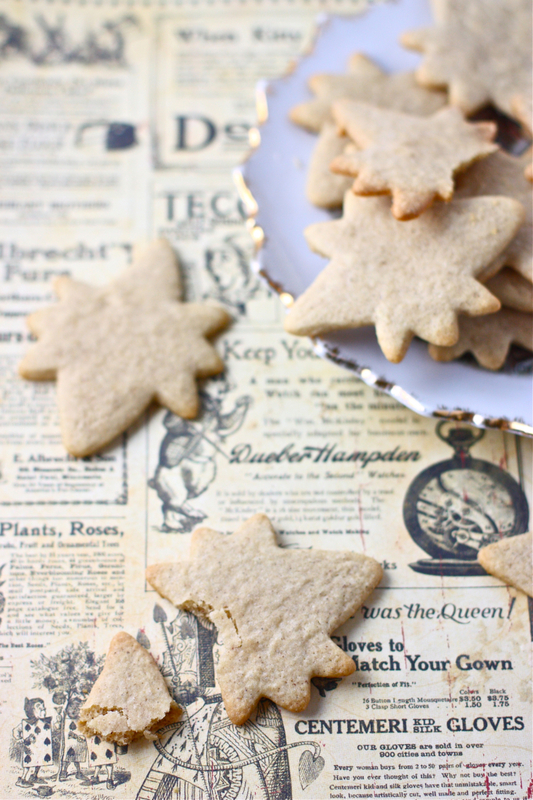 Love the conversation with your Grandma, these cookies look like the perfect Christmas cookie! Enjoy your time at home with family, and Happy Holidays! I love cookies with (tasty) hidden centers. The centers make me feel super stealthy. If only I could make them without humming the Mission Impossible theme song. Then I would be set. Off-the-hook cookies! And yes, I’d be glued to the web cam, too. I love my kitty! This is what happens to people who don’t have kids yet, I think. Those cookies look awesome! I’d totally be glued to the web cam. I’m leaving my dog with my boyfriend when I go home for the holidays and I’m having serious pre-separation anxiety! I’m going to miss his fuzzy face. Merry Christmas to you and your family Jenna. I have to tell you, I made the chicken pot pie the other night, hubby went back for seconds, something he rarely does, and claimed that was the best meal he’s had, in 31 years, really???? Looking forward to making the recipes that you provide, I want to be remembered for my wonderful cooking/baking, up to now, not so much, lol.. Also have to share, my son boards his two pups, he is glued to the web cam constantly, just means you’re great pet owners, something there should be more of. Thanks for sharing all your wonderful recipes this past year, looking forward to seeing what you cook up for 2012. Christmas Blessings. These look lovely! My dad would love them. Next year, maybe. I’ve had my fill of holiday baking for this year! The name of this cookie makes me giggle! I was going to make shortbread but the jam inside these sound more exciting, I might make these. i love the name of these cookies. i baked with my mom and sister yesterday and baked aunt gladys’ crescents and aunt theda’s ice box cookies (great names in our family, huh?) my favorite in the family arsenal of baked goods is a cake of my grandma’s called ‘the next best thing to robert redford’. good taste, gram, good taste. My grandpa likes Lydia cookies – a soft brown sugar drop cookie, with raisins. Actually, he likes anything sweet but this is his favorite. If it makes you feel any better… I am about to have a baby in a month, and sometimes I think to myself “I love my [also black] cat sooooo much, how will this baby compare?” Intellectually I know there will be no comparison, but I can’t help but love my kitty!!! Love this pic Jenna. What a one-of-a-kind cookie too. Silly name huh! With a center like that, what is not to love. totally normal to miss your cats. kitty cam? that’s a great idea, I want! Beautiful Cookies! I could use one right now 🙂 or two or three! I am the exact same way when I board my dog. We go to a cage-free place with webcams and my husband and I are constantly on their website trying to get a glimpse of him. Thank you! These look amazing! Thank you for your cookie recipe! I made them today and my husband said they were the best cookies ever! That’s no small exclamation from a man that has eaten as many cookies as he has. Thank you so much! I found this recipe while searching for one that matched or was similar to one I remember my grandmother making when I was a kid. 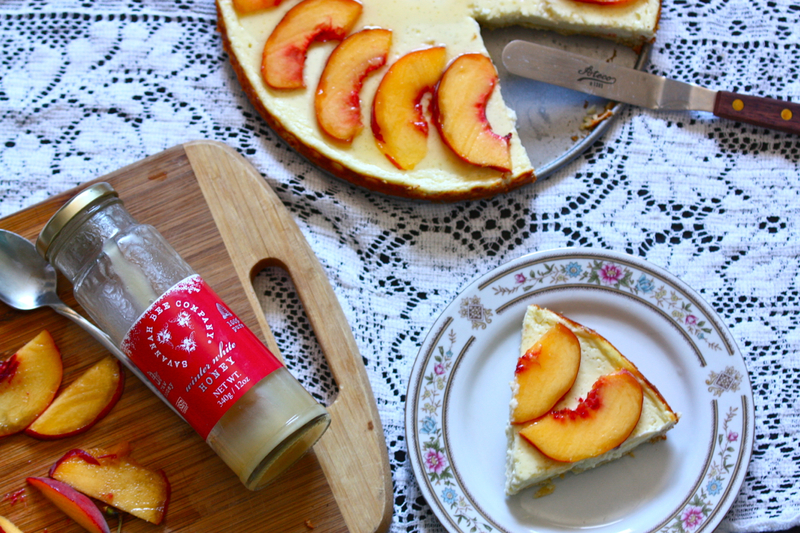 I have her recipe, but it has absolutely no instructions – just a list of ingredients! Regarding flour, she wrote “enough to roll” – hah! Aside from that, it is nearly identical to yours. She filled hers with dates. Thank you for this – I will be using it as I navigate through my Gram’s recipe. These are lovely cookies and I would like to make them for a tea. But I would like to make them with less white flour. What do you suggest? A combination of white and whole wheat pastry flour? or a gluten free four mix? What is your favorite jam to use inside? I have made several dozen cookies all different kinds for the holidays, this is my last one to do and I have choosen my apple filling for the center/ cinnamon and sugar sprinkled on top of each. I can’t wait.